The RGA4H is identical to the RGA4, but has the benefit of an additional steadying handle. Like the RGA4, the RGA4H is a three way retrieval block fitted with an up/down winch mechanism and the standard fall arrest capability. 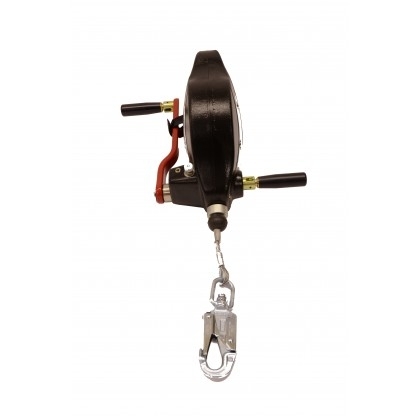 This unit can be used as a standard fall arrest block, but in the event of a fall, the operative can be winched up or down to safety almost immediately. As most rescue systems lower the casualty, the RGA4H can raise the operative to safe area, if the area below is unsuitable. The RGA4H can also be fitted to the RGR1 tripod for use in the confined access industry. The Man-riding rescue retrieval winch function is for use only as a rescue provision & NOT for access / egress. Where an operative is required to be lowered / raised for access / egress, then please use such equipment as the RGR7 50m Two-speed Man Riding RGR7 Winch. This arrangement must be backed up with a independent separate fall arrest system, and a rescue provision that is also separate to the winch. Where a 15m maximum length is suitable the RGA4 / RGA4H can provide both fall arrest back-up as well as the rescue provision. If the requirement is for more than 15m metres, please contact us for further details.